After taking it easy for a few days in Aspen and Leadville (Part III of our trip), Chester and Gretel had adjusted the altitude. However, I was still feeling a bit ill. I was doing all of the right things – resting and drinking water like a fish – and even tried getting some oxygen in a can like a friend suggested. I wasn’t sure we were going to be able to attempt hiking Mt. Elbert with the way I was feeling. I really, really wanted to though so, as one last-ditch efforts, I took to Google to see if I could find a remedy that hadn’t been suggested to me yet. 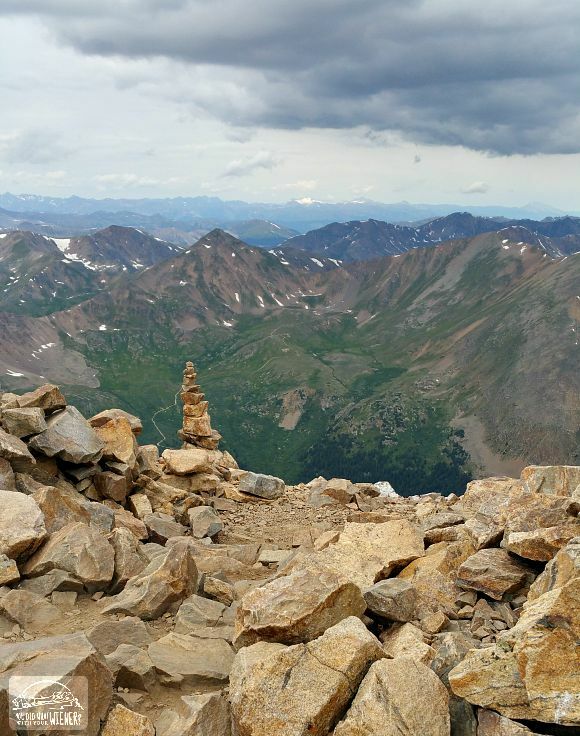 It turns out that regular ol’ ibuprofen can sometimes help altitude sickness so I tried that. I woke up on our last day in Leadville and actually felt pretty good. We decided that we would give Mt. Elbert a try. The worst case was that we were going to have to turn back like we did on Mt. Sherman. We decided on the Northeast Ridge trail (there are at least two trails that lead to the summit) which was 4.5 miles one way with an elevation gain of 4,700 feet. The first part of the trail was through forest and it wasn’t that steep. That was a pleasant surprise. BUT that meant that most of the 4,700 feet of climbing would be left for the highest elevations. I think I was in denial about what that meant as we wandered through the trees and came out above tree line. The trail started to climb more steeply but the trail surface was still pretty smooth. Then it got really rocky. And then it got really, really steep! At this point, we decided to put Chester in the backpack again. I am pretty sure he could have made it on his own but his old bones would have been super sore for the next couple of days and we didn’t want to do that to him (or rather, let him do that to himself). So up we went. And then up some more. We had gotten a little later start than we hoped, and the trail took a bit longer than we thought, so we were in danger of encountering an afternoon thunder storm. We kept a really keen eye on the weather but the clouds were moving in and looking more ominous than we would have liked. Many people were still heading to the top but one group that had been hiking behind us decided to turn back. 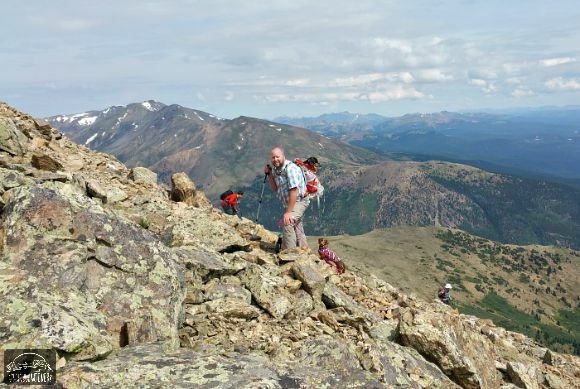 A pair of seasoned hikers passed us on the way down and warned that we might want to reconsider pushing for the top. The weather wasn’t at a point that I felt uncomfortable with so we kept a vigilant eye on the sky and pushed on. It started to get darker and windier though. Then I started feeling exhausted, a bit delirious, and started to get a headache again. Hubby and Gretel were feeling ok but I definitely wasn’t. I literally stopped, took a couple of deep breaths, and swore I couldn’t go on. I did this every two or three steps. And the steps I did take were SLOW. About a 1/2 mile from the top, I finally convinced Hubby to take Gretel and go to the top without me. He didn’t want to but I kept insisting because I wanted him to check this high point off of his list and I wanted Gretel to make it to the top. I wanted to quit SO BAD, but I didn’t give up. With every step I swore that I was done… and then I would take one more. I trudged my way, delirious and spent, to the top. The feeling of accomplishment, and the view, was amazing. Hubby was so proud that I didn’t quit. I was super proud of me too because, with my back issues, I wasn’t sure if I would ever be able to do something this steep and hard again. I was a beyond proud dog Ma too. 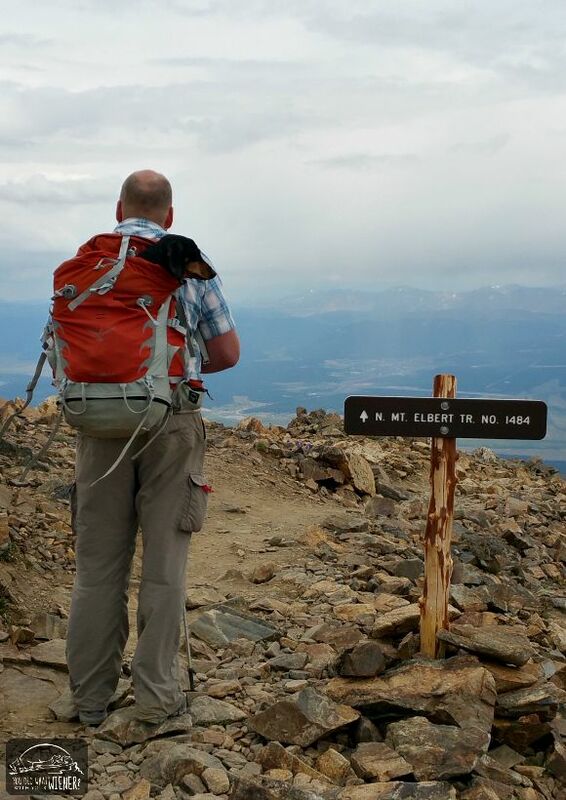 OMG, Gretel, at 10 lbs, made it to the top of the highest 14er in Colorado all by herself! And even though we had to carry him for the steepest part. Chester hiked about 4 miles (8 by the time we were done) at 13 years old and at an elevation of over 11,000 feet! I swear these two are amazing. We stayed long enough at the top to get a few good pictures but started hustling back down when the wind picked up and the clouds got darker. We still paused here and there to smell the flowers but our goal was to make it back below tree line before the weather got too much worse. It did start to sprinkle on us before we ducked into the trees but the clouds and wind were calmer at the lower elevation. All in all, our dog friendly road trip to Colorado was amazing! The 15+ year wait to go back was totally worth it. We’re already plotting a trip back. 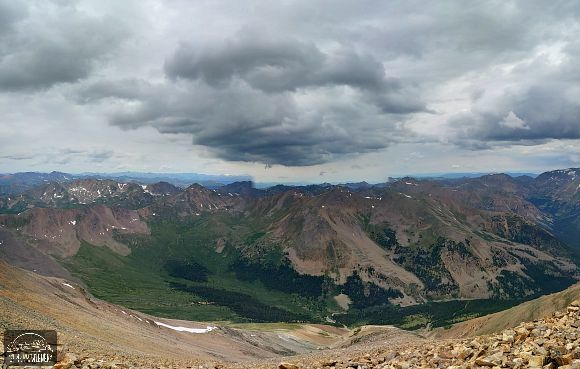 I would like to hike another 14er or two. We also might like to go back to Leadville during the Leadville 100 mountain bike race. Hubby is dreaming of completing the Colorado Trail Mountain Bike Race from Durango to Denver. I would love to go back and spend time in Glenwood Springs because the Glenwood Canyon is Ah-mazing and I would love to visit the steam caves again. Be sure to check out the other parts of our trip – Part I – Seattle to Denver, Part II – Denver to Salida and Part III – Aspen & Leadville. 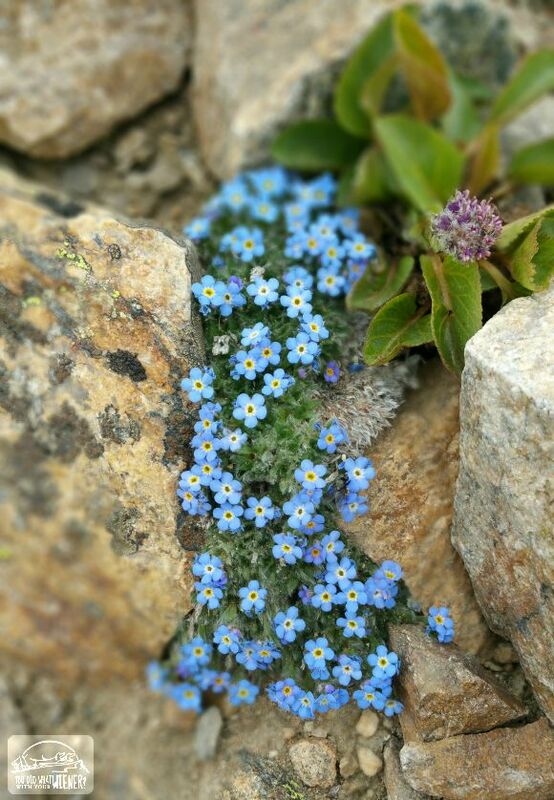 Great picture of the Forget-me-nots. One of my favorite mountain flowers. I’ve always loved them but I am not sure I have every seen close to the ground mountain ones like these. Yay, you and hubby/doggies. Gretel is awesome. I lost my doxie, Oscar, last February…but he LOVED long walks. The longer, the better. I know he would have enjoyed hiking too. FYI, do all you can (hiking) while you are young enough. I’m in my early 60s, and miss hiking/biking. My knees and back finally forced me to stop both, though I still take my other two small dogs to a wooded park on a regular basis. Loving your posts from the road trips. Getting old and having things fail is hard. 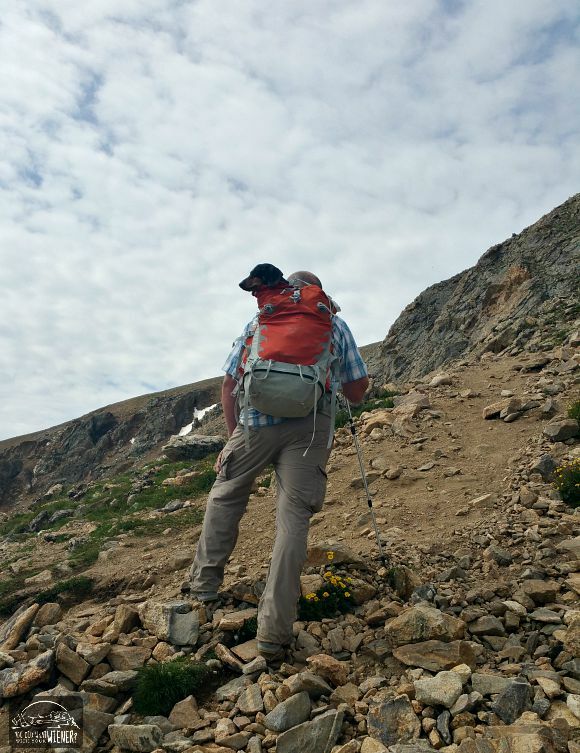 A couple of years ago I was having so much back trouble I wasn’t sure I would every be able to do a hard hike again. It’s feeling better now so I am taking advantage but know there may be a day I have to stop again 🙁 At least you can still get out to walk in the woods. Congrats on completing the climb! That is impressive and stunning. Oh my! I’m glad you made it to the top – what beautiful scenery, even the threatening clouds are thrilling to see! And, go little dogs, go! 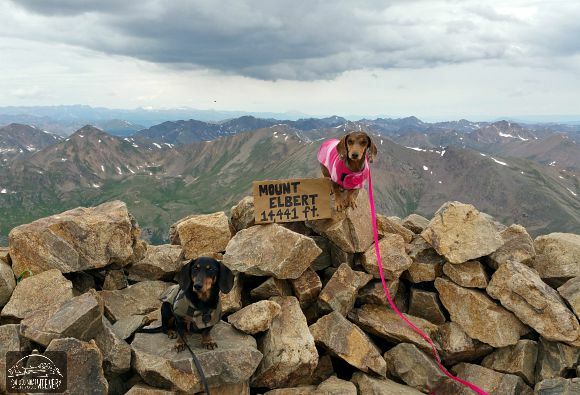 I would like to think they were the first Doxies to make it to the top of a 14er but I know they are not 🙂 It’s an accomplishment for any dog that is for sure! Great hiking and climbing, dogfriends! AND human friends! Wow! That was a high mountain. Smart move, hitching a ride, C.
That is awesome! Mom says it sounds like running the last part of a marathon. She feels sick, she hurts, can’t imaging making it another three feet, but she talks herself into it one step at a time and the mind games do work and she finishes just as you did! Conquering big things like this are not just physical, but a mental challenge as well. Great accomplishment! Yeah, I guess it kind of was like that. I think I felt more delirious at 14,000 feet but my marathon WAS over 10 years ago though 🙂 They’re both amazing physical accomplishments though that deserve kudos. There are some things that people who haven’t pushed themselves that far can’t ever understand. I just rechecked my photos from Whistler to see if we were in meters or feet so I know you were more than twice as high as we were and we had to take a lift to the top. Boy am I a slacker. But congratulations to you. I just hope that one day your stubbornness isn’t going to get you in trouble. Whistler mountain is about as high as our high peaks around here (obviously not Rainier or Mt. Adams). I’ve never experienced thin air like at 14000 feet. Wow, you & your doggies are so motivated & an inspiration! 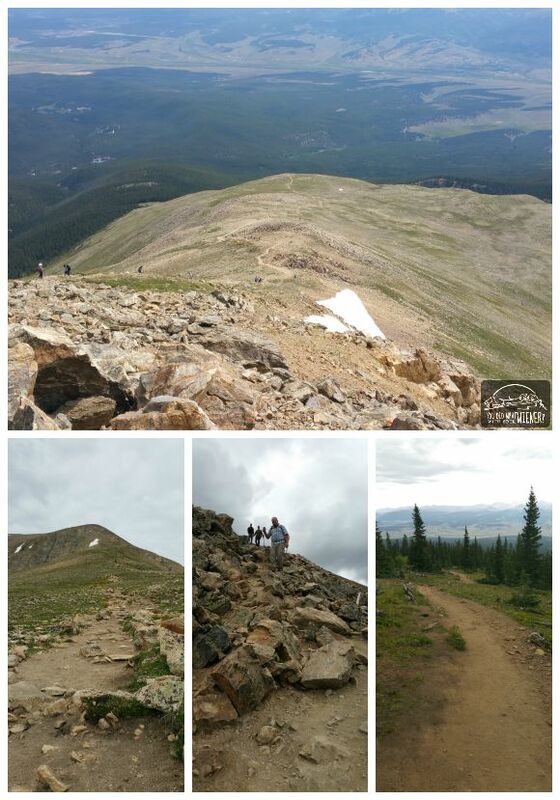 Mom is a Colorado native and Leadville is one of her favorite destinations, but she has never hiked Mt. Ebert. She read somewhere that suggested humans should allow 3 days to get adjusted to Leadville’s altitude. I don’t know what that would equate for doggies. Bessie has strong healthy lungs & big nostrils, so she would probably do better than my humans. She would have fun exploring the little mountain town with your dachshunds! As for me, I guess I would just have to visit it through pictures. Mew Mew!